Living Art Gallery in Hungerford, Berkshire, UK - permanent exhibition. For location and opening times, see the Living Art Gallery website. Altered States Shaw House, Newbury, Berkshire, UK - 4th - 27th May 2019. For more information, see the Altered States Exhibition website. More information about the venue can be found on the Shaw House website. Oxford Sculptors Group Exhibition at Spetchley Park Gardens, Worcestershire, UK - 21st August to 8th September 2019. For more information, see the Oxford Sculptors Group website and the Spetchley Park Gardens website. Rodmarton Garden Sculpture Trail, part of 'Crafts Alive', an exhibition by the Gloucestershire Guild of Craftsmen at Rodmarton Manor in Gloucestershire, UK - 5th to 9th to September 2018. For more details, location and opening times, see the Gloucestershire Guild of Craftsmen website. To see the Guild flyer including the event, click here. Sculpture Heaven, near Cardigan in West Wales, UK - April to August 2018. Open Easter, Wednesdays & Thursdays and August Bank Holiday. For location and opening times, see the Sculpture Heaven website. Kempton Steam Museum London, UK - 23rd and 24th September 2017. For location and opening times, see the Kempton Steam Museum website. Oxford Sculptors Group Exhibition at Kiftsgate Court Gardens, Gloucestershire, UK - 19th August to 6th September 2017. 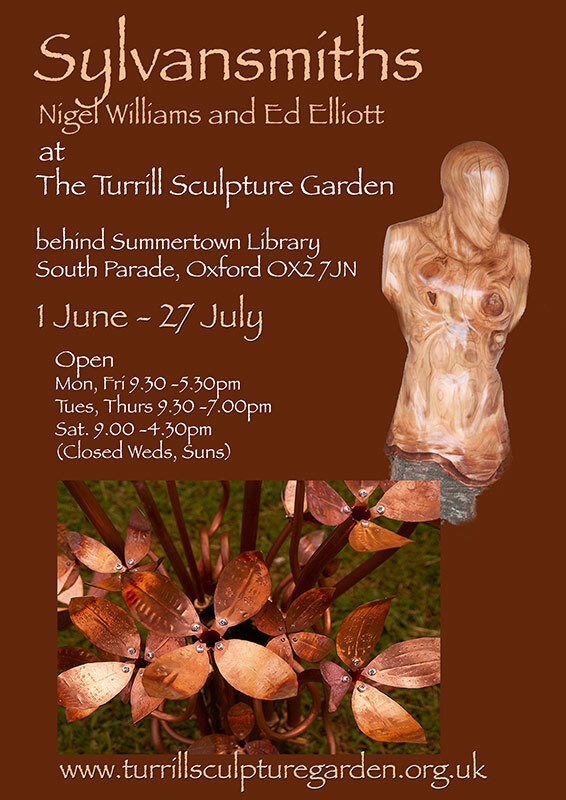 For more information, see the Oxford Sculptors Group website and the Kiftsgate Court Gardens website. Nuffield Orthopaedic Centre, Oxford, UK - 7th November 2016 to 6th January 2017. A large exhibition of the "K-scopes" project, spread around this modern hospital. For location details, see the Nuffield Orthopaedic Centre website. Royal Landscape Savill Garden 2016 Sculpture Exhibition in Windsor Great Park, UK - from 3rd September to 20th November 2016 (which I also curated with Carol Orwin). For more information, see the Savill Garden website. Avebury Manor 'Art in the Garden', by Avebury Stone Circle in Wiltshire, UK - 27th August to 25th September 2016. For location and opening times, see the National Trust Avebury website. The Elemental Sculpture Park, near Cirencester in Wiltshire, UK - long-term exhibition summer 2015 and 2016. For more information, see the Elemental Sculpture Park website. Fringe Arts Bath at 44AD Artspace, Bath, UK - 27th May to 12th June 2016. For more details, see the Fringe Arts Bath website. For venue location and contact details, see the 44AD Artspace website. Roses Theatre Tewkesbury in Gloucestershire, UK - 26th April to 5th June 2016. For more information, see Roses Theatre website. Showborough House Affordable Garden Art Exhibition, near Twyford in Gloucestershire, UK - 28th April to 12th June 2016. For more information, see Showborough House website. Buckinghamshire Arts Society Spring Exhibition, at The Fitzwilliams Centre, Windsor End, Beaconsfield, Buckinghamshire, UK - 22nd April to 24th April 2016. For more information, read the Invitation here (PDF - 580Kb), or see the Buckinghamshire Arts Society website. Sculpture at the Shed, Tetbury , Gloucestershire, UK - 1st to 21st October 2015. For more information, see the Tetbury Goods Shed website. For detailed location information, see here. Read the event flyer here. Entrance is free. More about the Goods Shed development here. National Trust Chedworth Roman Villa, Gloucestershire, UK - 12th September to 4th October 2015. For more information, including location, opening times and other details, see the National Trust website. 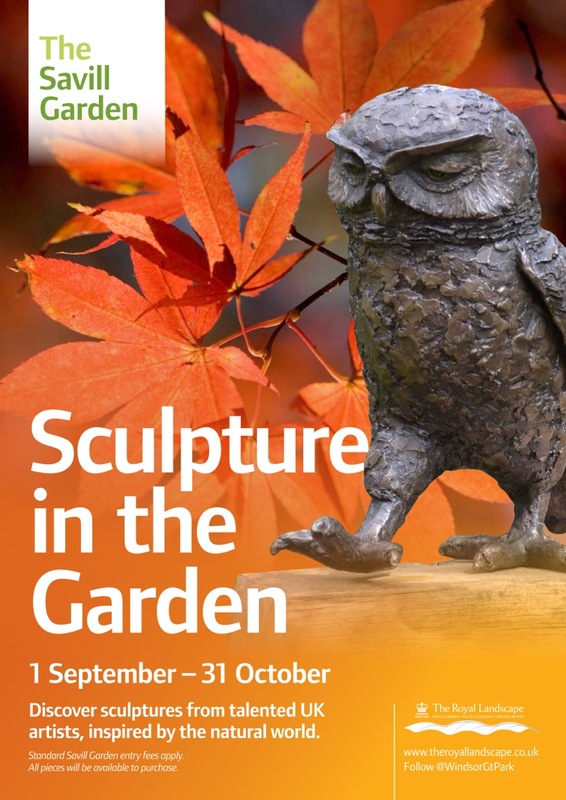 Royal Landscape Savill Garden 2015 Sculpture Exhibition in Windsor Great Park, UK - from 31st August to 30th October 2015. For more information, see the Savill Garden website. Sculpture on the Farm, near Stewkley in Buckinghamshire, UK - 13th to 28th June 2015. For location information, see the venue website. Sculpture in the Vineyard, Bothy Vineyard, Frilford Heath, Oxfordshire, UK - 23rd May to 7th June 2015 (not Mons,Tues). For more information, see the Bothy Vineyard website, and their sculpture newsletter. Showborough House Affordable Garden Art Exhibition, near Twyford in Gloucestershire, UK - 30th April to 14th June 2015. For more information, see Showborough House website. Ace Space Newbury, Berkshire, UK - 25th February to 14th December 2015. Giant exhibition of the "K-scopes" project. For more information, see the item on the News/Blog page, and the Ace Space website. For more information on the "K-scopes" book, see here. Modern Art Oxford, UK - 17-20th December 2014. Workshop and exhibition as part of "The Factory Floor" event associated with the "Love is Enough" exhibition of William Morris & Andy Warhol. For more information, see the item on the News/Blog page. Read the detailed schedule of all the workshops here. 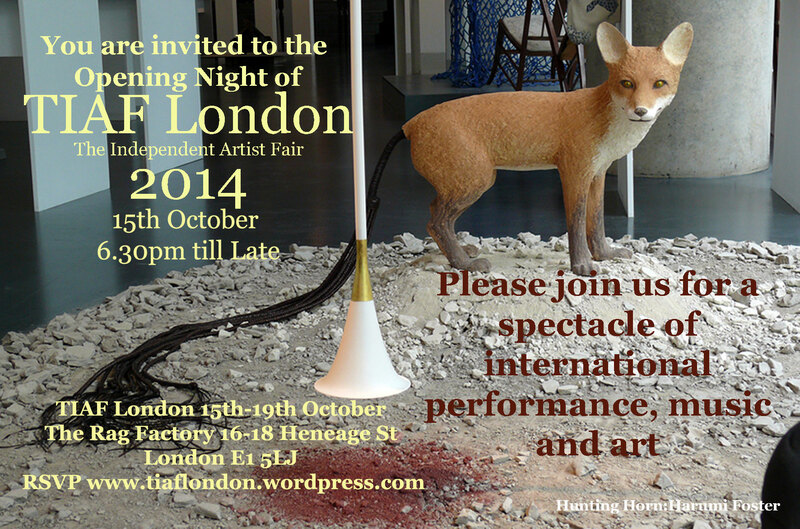 The Independent Artist Fair at the Rag Factory, off Brick Lane, London, UK - from 15-19th October 2014. For more information, see the The Independent Artist Fair website. For location and contact details for the Rag Factory, see their website here. Read the invitation to the Opening Night here. Download the Press Release with more details (showing The "FarmStrong") here (PDF - 170Kb). Royal Landscape Savill Garden 2014 Sculpture Exhibition in Windsor Great Park, UK - from 1st September to 31st October 2014. See the event poster here. Download the Catalogue and Map here (PDF - 900Kb). Sir Harold Hillier Gardens Art in the Garden Exhibition, near Romsey in Hampshire, UK - 17th May to 19th October 2014. For more information, see the Hillier Gardens website. Romsey World of Water, Hampshire, UK - long-term, from 28th June 2014. One-man exhibition of sculpture in an aquatic environment. 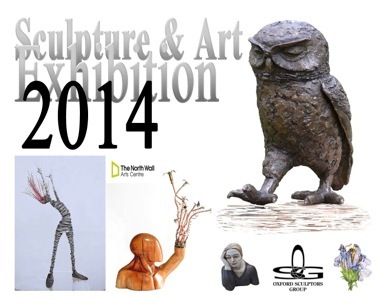 Wyndcliffe Court Summer Sculpture Exhibition, near Chepstow in Monmouthshire, UK - 20th June to 10th August 2014. For more information, see Wyndcliffe Court website. Oxfordshire Artweeks 2014, with Neil Butterfield - 17th to 26th May 2014. For more information, see the Oxfordshire Artweeks website. The Oxfordshire Artweeks online gallery can be seen here. Showborough House Affordable Garden Art Exhibition, near Twyford in Gloucestershire, UK - 1st May to 15th June 2014. For more information, see Showborough House website. 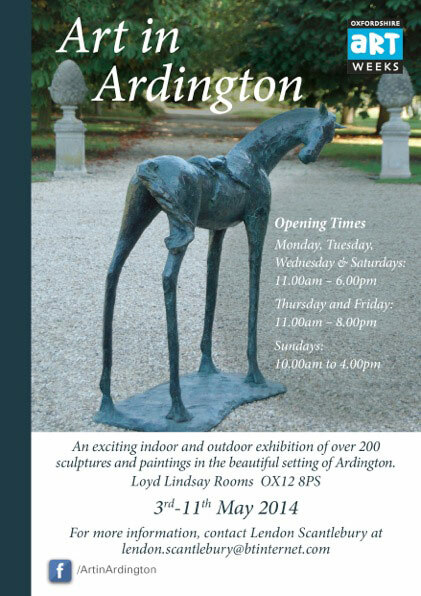 Sculpture Ardington, near Wantage, Oxfordshire - 3rd to 11th May 2014. Formore information, see the Oxfordshire Artweeks website, and Lendon Scantlebury's website. See the event poster here. 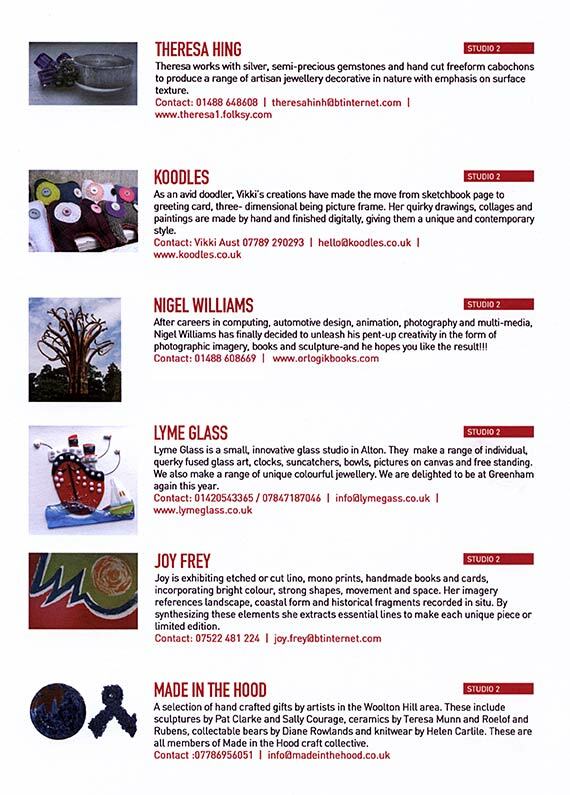 Henley Arts Trail, Twyford, UK - 3rd to 5th May 2014, in conjunction with the Creative Landscape Co. For more information, see the Henley Arts Trail website. For location and opening times, please see the Creative Landscape Co. website and the Big Plant Nursery website. Read the article about it in Henley Life magazine here. Whittard of Chelsea displayed Flickendorfer's Celebrated Tea Refinery at their store at 17 Market Place, Covent Garden, London, UK from 7th March to 3rd May 2014. For information on location and opening hours, see the Whittard website. Read the article about it on Whittard's blog here. Oxford Sculptors Group Exhibition at the North Wall Arts Centre, Oxford, UK - 14th January to 6th February 2014. 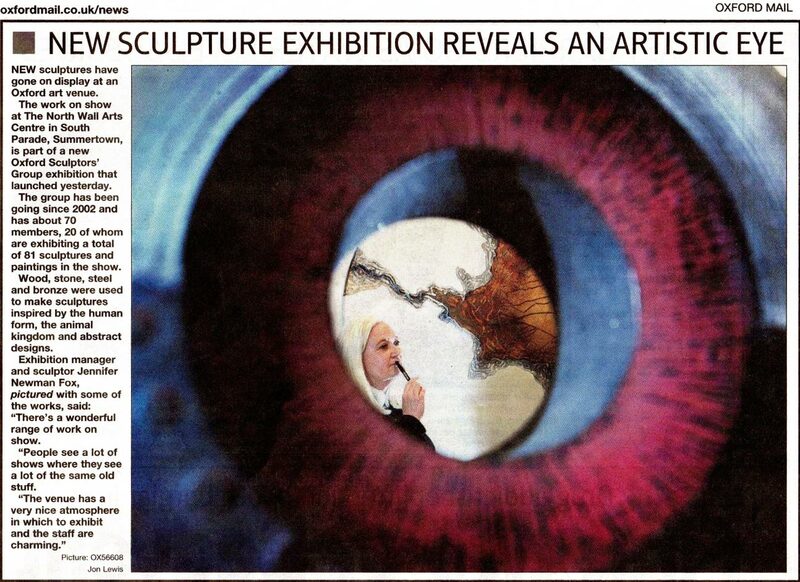 For more information, see the Oxford Sculptors Group website. See also the Event Postcard front and rear, and the Private View Invitation. Private corporate exhibition (visit by invitation only) at Marlborough Town Hall, Wiltshire, UK - 12th December 2013. Art Scope Gallery at the Circle Hospital, Reading, UK - long-term, from 9th September 2013. More information about the gallery can be found here. See the Art Scope Gallery postcard here. Read the Circle 'advertorial' in Berkshire Life magazine about the gallery here. This exhibition was refreshed with new work in September 2014. 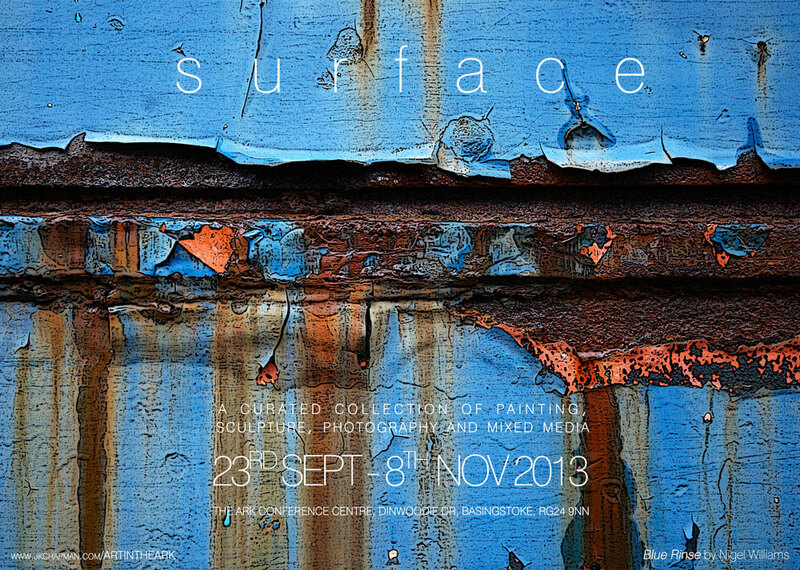 "Surface" Exhibition at the Ark Centre, Basingstoke, UK - 23rd September to 8th November 2013. Detailed information is available on the Art in the Ark website. Featured artists are documented here. See the flyer for the exhibition here (based on the 'Blue Rinse' image from my Steel Triptych, exhibited there last year). The invitation to the Private View can be found here. See photographs of the exhibition (with me chatting to the curator Jonathan Chapman, and a group of 6 of my pictures in the background) here. Read a comprehensive Q & A "interview" with me here. Royal Landscape Savill Garden Sculpture Exhibition in Windsor Great Park, UK - from 1st September to 31st October 2013. For more information, see the Savill Garden website. See the exhibition layout map and leaflet here (sculptures to note are numbers 6,7,8 & 9!). Oxford Art Society, The Oxfordshire Museum, Woodstock, Oxfordshire, UK - from 21st September to 13th October 2013. For more information, see the Oxford Art Society website. National Trust Hidcote Manor Gardens Sculpture Exhibition, Gloucestershire, UK - 7th to 29th September 2013. For location, opening times and other details, see the National Trust website. See the Hidcote Manor flyer (2Mb) here, and the National Trust poster for the event (featuring "Teluma calamus") here. "h.Art 2013" (Herefordshire Art Week), Venue 65: Trumpet Corner Studios, near Ledbury, Herefordshire, UK - 7th to 13th September 2013, where Sapien percuriosus (collaboration with Ed Elliott) was displayed. For more detailed information, see the h.Art website and the Trumpet Corner website. Art Exhibition at Asylum V Steampunk Festival, The Collection, Lincoln, UK - 16th August to 15th September 2013. 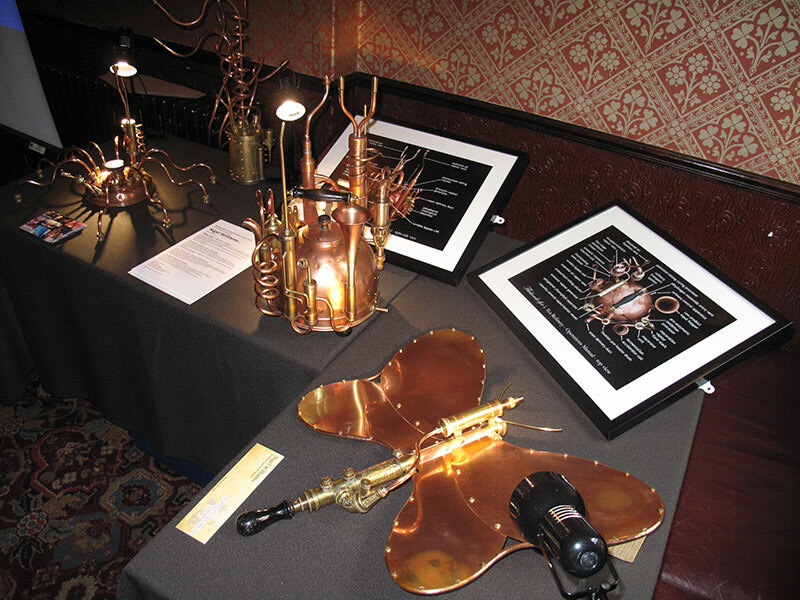 For more information, see the Victorian Steampunk Society website and The Collection website. "Manifestation" Art Exhibition at Steampunk Doncaster, 15th and 16th June 2013. 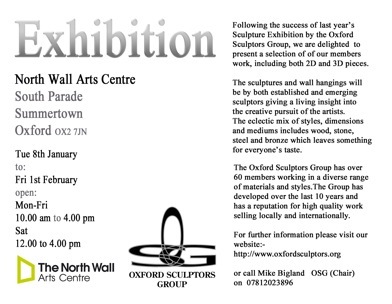 Oxford Sculptors Group Exhibition at the North Wall Arts Centre, Oxford, UK - 8th January to 1st February 2013. To see the publicity postcard, click here. To see the Oxford Mail newspaper article, click here. To see this article on the web, click here. Read a review of the exhibition by Claire Winlow on the Weekend Notes website. Autumn/Winter 10th Anniversary Exhibition at the Ark Centre, Basingstoke, UK - 15th October to 29th November 2012. A gallery of photographs of this exhibition can be found here. 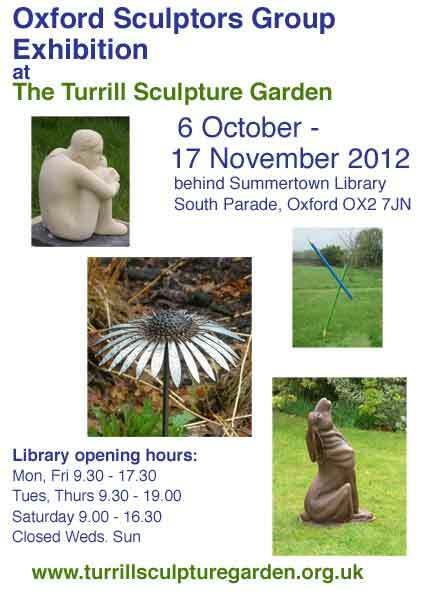 Oxford Sculptors Group Exhibition at the Turrill Sculpture Garden, Oxford, UK - 6th October to 17th November 2012. For location, opening times and other details, see the event poster and the Turrill Garden website. "appART" at Secretts, Milford, Surrey, UK - 6th to 21st October 2012. 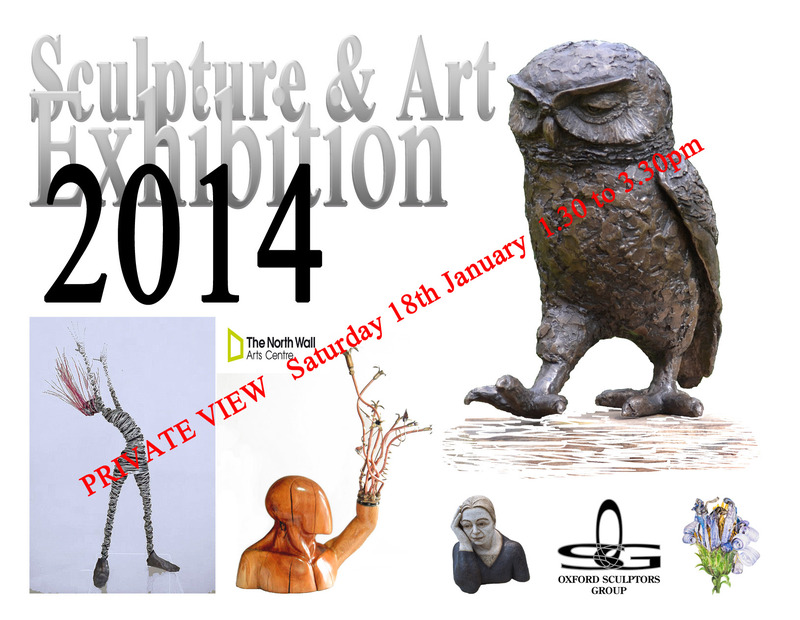 Organised in conjunction with the Surrey Sculpture Society. "Open Water" Exhibition at National Trust Mottisfont Abbey, Hampshire, UK - 29th September to 18th November 2012. National Trust Hidcote Manor Gardens Sculpture Trail, Gloucestershire, UK - 8th to 30th September 2012. Royal Landscape Savill Garden Sculpture Exhibition in Windsor Great Park, UK - from 1st August to 30th September 2012. Surrey Sculpture Society Summer Exhibition at the National Motor Museum at Beaulieu in Hampshire, UK - 24th May to 2nd September 2012. More details on Beaulieu website. Map of exhibition here (check Number 31!). 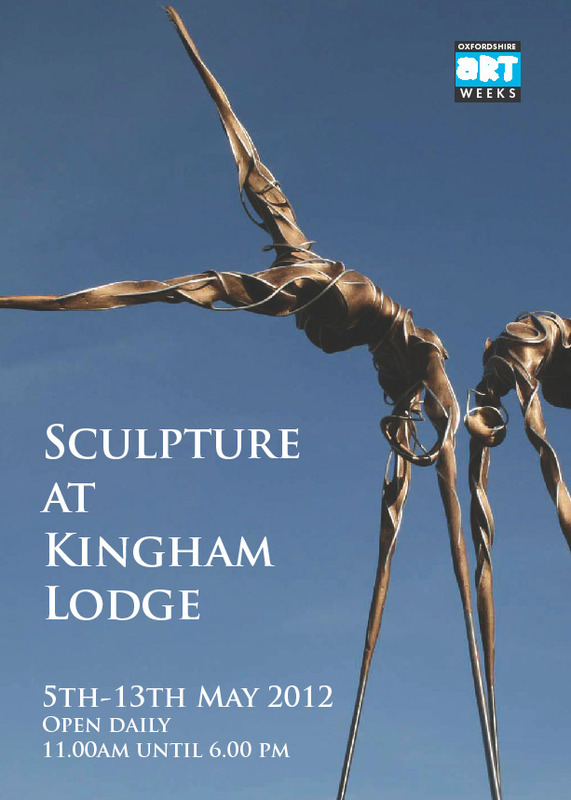 "Sculpture at Kingham Lodge" - 5th May to 13th May 2012. For full details, see the Kingham Lodge website. This event was part of the "Oxfordshire Art Weeks" art festival. To see the flyer for the event, click here. 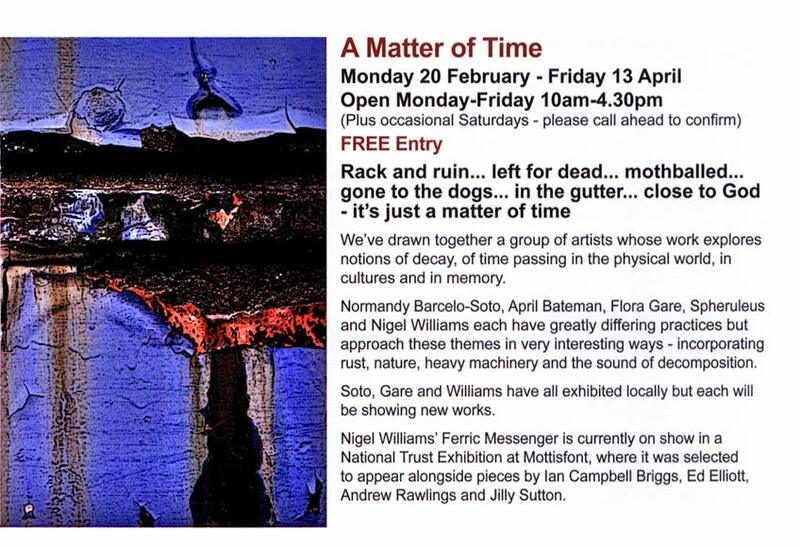 "A Matter of Time" at Arlington Arts Centre, Newbury, Berkshire, UK - 20th February to 13th April 2012. To see their brochure article, click here. A detailed photo-gallery of the exhibition is available here. "Pieces of an Angel" at Trumpet Corner Gallery (photographs of Ed Elliott's 'Greer' sculpture) - 14th to 31st January 2012. 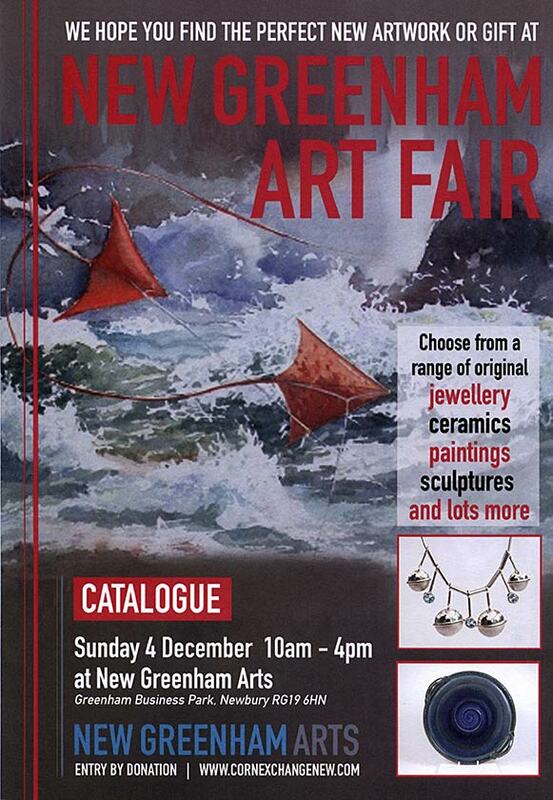 New Greenham Art Fair, Newbury, Berkshire, UK - 4th December 2011. To see the catalogue, click on front cover, or page. National Trust "Angel Garden" at Mottisfont Abbey, Hampshire, UK - 2nd December 2011 to 29th January 2012. To see the National Trust brochure, click front or back. Nigel Williams is Coordinator and Webmaster of the Oxford Sculptors Group, and a member of the Surrey Sculpture Society.